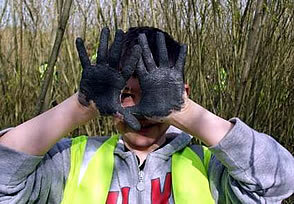 Carymoor Environmental Centre is a great venue for all sorts of outdoor education experiences. 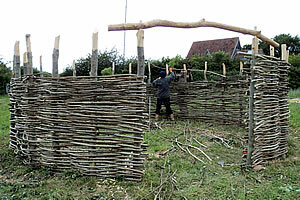 Our waste education site tours and wildlife-based 'Wild Days Out' are already popular with schools but there are so many more things we would like to do - History Days to show how our ancestors lived in tune with the environment, courses like hedge-laying, willow-weaving and wildlife-friendly gardening, environmentally-friendly birthday parties... With this in mind we have just added more space to our existing eco-friendly buildings by putting up an exciting new outdoor classroom - a replica iron-age round-house. The six metre diameter round-house is designed to replicate dwellings that would have been built in the iron-age Glastonbury Lake Village. It is built out of locally sourced wood - ash poles from Ham Hill Country Park, strong and easily worked, form the framework for the walls and roof, and hazel rods are used to weave the six foot high walls. The roof will be thatched with reed, abundant on the Somerset Levels, producing a building which is both sustainable and biodegradable. The fun bit comes last - the walls will be daubed with a mixture of local clay and straw. Come and join us on Saturday 2nd July between 10.00am and 4.00pm for our Daubing Day and try your hand at this nice messy craft! This is a fun activity suitable for the whole family - but remember to wear old clothes as you will probably get very dirty! There will also be a chance to look around the Carymoor Nature Reserve which has been created on the restored area of the landfill site, and compare this with the still-active tipping face. Light refreshments will be available. For more information email or phone 01963 350143. 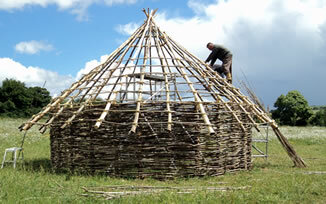 Watch the round-house grow on Carymoor's Facebook page. To keep up to date with all of Carymoor's events visit www.carymoor.org.uk and sign up for our email newsletters.